Well this second week of September has started with a distinctly Autumnal feel here in Blighty, don't you think? It looks like the lovely weather we had last week is a thing of the past. I admit to being quite obsessed with the weather. I check the weather every day (sometimes twice!) online, I even check it to see how the weather is near our cottage and how the weather is where my family lives. A sunny day generally results in a sunny disposition where I am concerned. Is it a very British thing, this weather obsession? My overall memory of this year is that the Summer was a pretty good one. 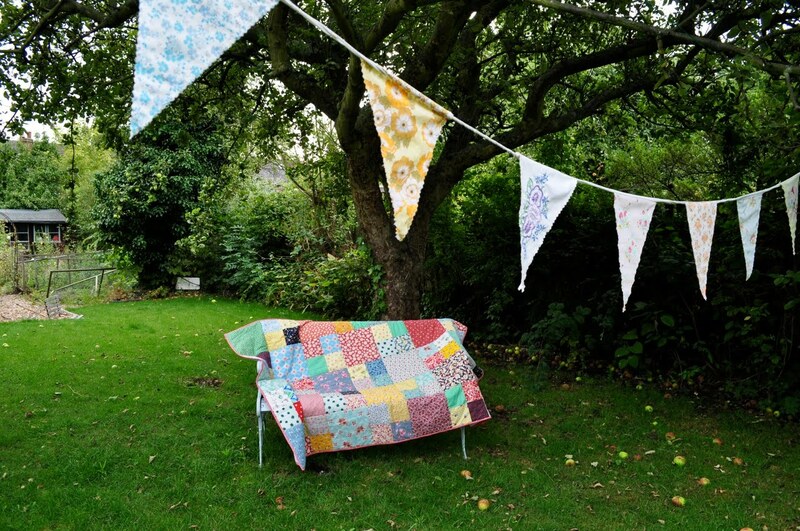 This photo of a quilt I was commissioned to make, reminds me that August was pretty dodgy. I was nipping between the showers and drying off the bench to take this photo! The apples were already falling and the showers have returned the lawn to its lush green glory, it even needs a mow! Of course, the downturn in the weather is not all doom and gloom. In the Summer, there's all that time spent outside gardening and in particular, watering, oh yes, the hose was my best friend. 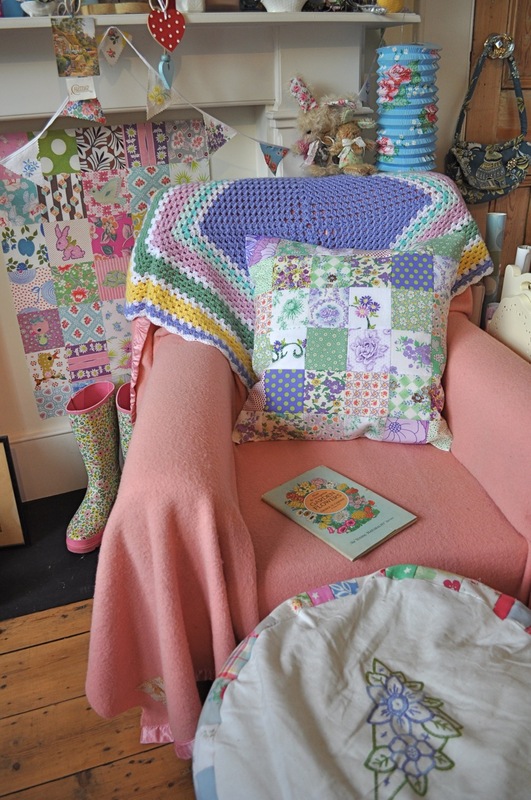 Rain and cold means one needs to stay inside and what can you do inside? That would be sewing, of course! Crochet hook rolls in a rainbow of pretty hues have rolled off the HenHouse production line (two are left here). It's great fun putting together all the fabrics for these even if patchworking that centre section is a tad laborious, the end result is so worth it. And then there is the oh so pretty purple and green patchwork cushion of which I gave you a sneak peak last time. This was also a commission from a lovely lady and a very good idea it was, too. And finally (for now! ), there was more patchworking today, another request, the colour scheme being red, pink and aqua. Phew! Believe it or not, I also had to take my machine in for service and repair last week so there could have been more goodies to show. Time to rest a while then, and every now and then the sun is peeking out from behind the clouds though it's a tad blustery (told you I was obsessed with the weather!) so I'm venturing outside to show you a few other things. 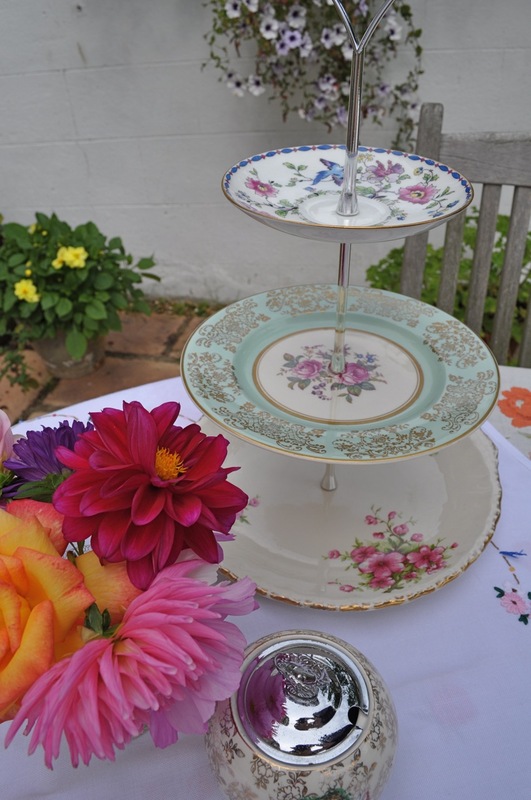 Mr HenHouse has had a busy time and been putting together some pretty cake stands for me, all made with vintage china. 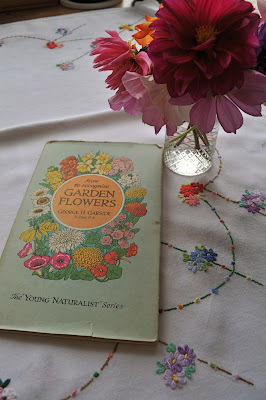 These are always popular at the fairs we attend so we are being a tad more organised as last time, Mr HH was putting them together during the fair! The colour scheme of this one is particularly pretty. Do you remember I mentioned I bought some pretty goodies on the Isle of Wight when we holidayed there in July? 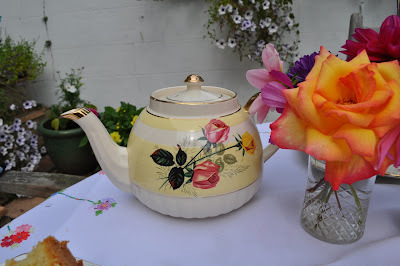 This gorgeous Sadler teapot came home with me from Suzes Room in Ventnor. 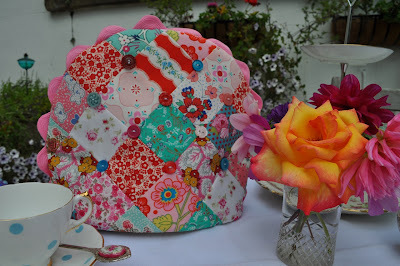 Because this is the patchworky commission I just finished today, a rather fetching tea cosy. I think the colour scheme has worked really well. I do love to think of my lovely customer taking tea with her very British tea cosy over in Oz. Maybe with a bbq? Out by the pool? Yes, that would be very cool indeed. Hope you love it once it lands, T, it looks even better in real life! 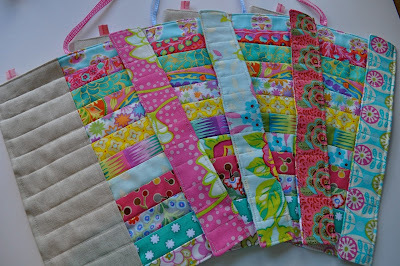 Some polyfill stuffing, needle and thread and some pretty vintage feedsack fabric et voila! Now did someone say cake? 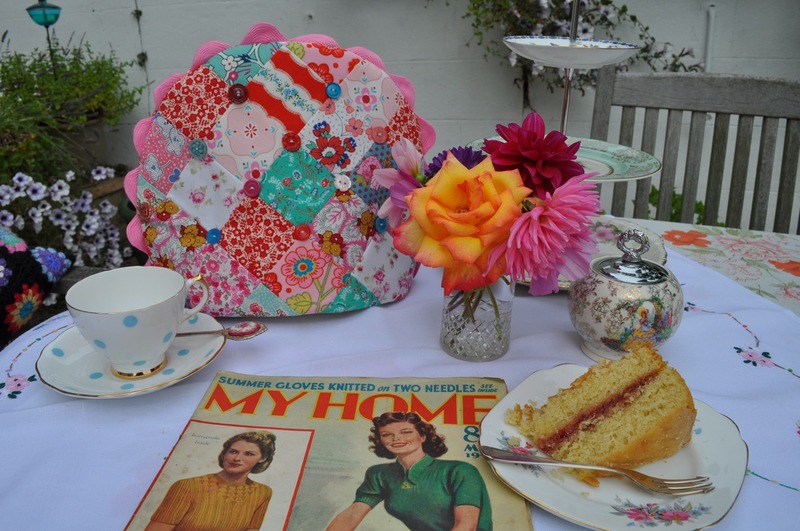 that tea cosy is ridiculously cute. 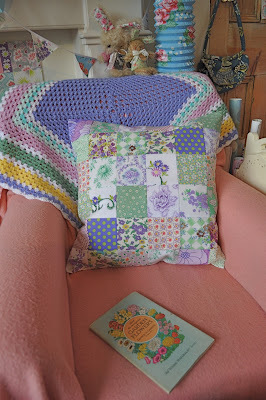 i have a patchwork one made by my hubbies great grandmother. nobody wanted it, i snapped it up!! I've just discovered your blog and I love it!! I've been scrolling through and literally cannot stop! My Dad keeps walking past saying "You done on that computer yet?!" - he'll just have to wait! 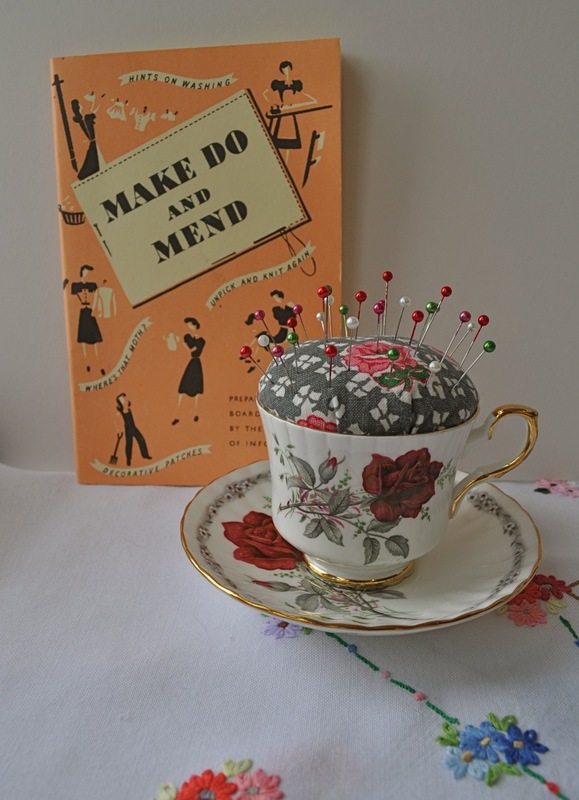 Loving all this weeks makes, especially that tea cup!! I especially like the photograph of you afternoon tea setting and the crochet cushion is FAB! Everything looks really beautiful, as ever! 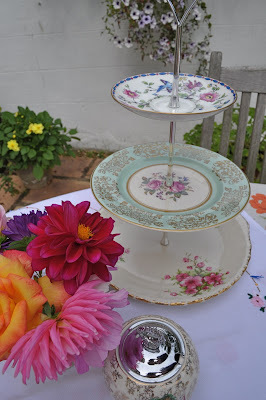 How clever to be able to make such a pretty cake stand! As for the weather checking question, I have to confess to being just like you, and I'm a Belgian! Maybe it has something to do with getting older?? I've been following your blog for some time now. And I just want to comment on how lovely it is. I live in the US and love being taken to the English countryside every time I see/read your postings. I'll probably never get the chance to visit England...except through your blog. I must confess you that I have your same obsession for weather forecast and I'm even not British! And hugs to Mr Munchkin! Hi Hen! I thought your comment about being obsessed with the weather was cute, because I'm exactly the same way! If I'm not watching it on the news, I'm looking it up on line. I look ahead 10 days to see if there might be hopes for rain, but usually find sun, sun, sun. :-( So, it's probably not a British thing, since I'm not, but I am married to one afterall! 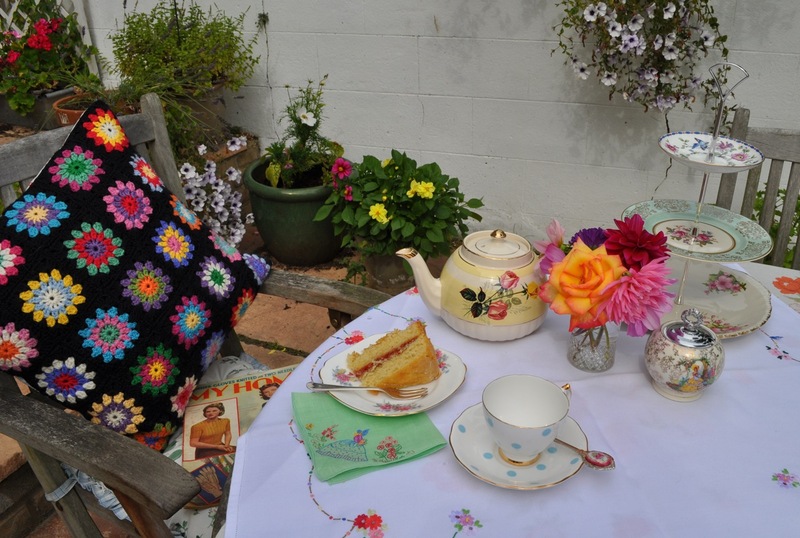 Lovely makes there hun x Particularly the cake stand!!! OOOOOH! What an exquisite tea cosy! Am so glad I requested it. :-) Loved peeking at all of the other bits and bobs, too. 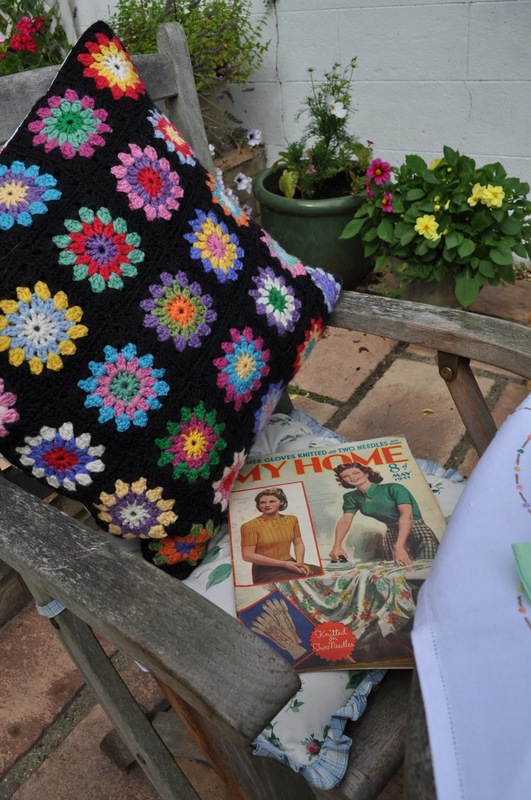 And I do believe your purple and green cushion will be a winner! I definately have an obsession with the weather. 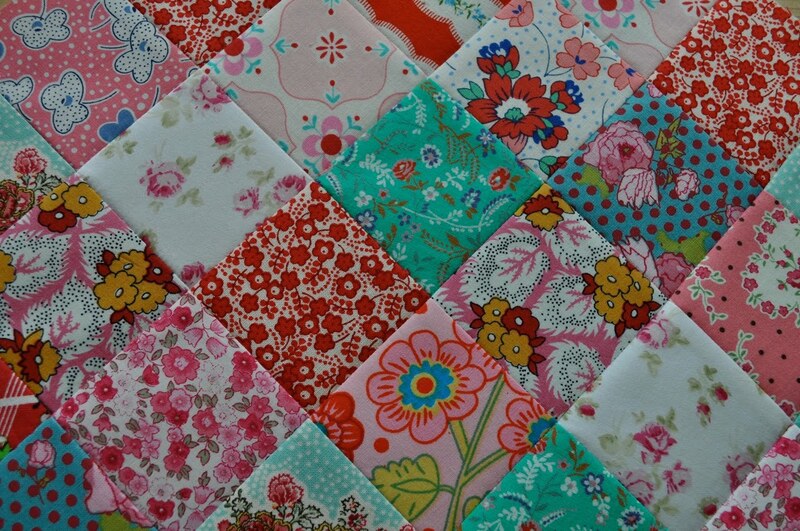 As ever gorgeous makes - I wish I could get my patchwork as neat as yours. 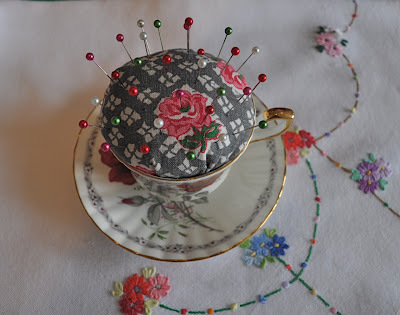 Wow, love your tea cup pin cushion. So sweet. Actually all you do is lovely. Have a wonderful day. Hello there - I've just been reading my French magazine where they discuss the French obsession with the weather - forecasts, websites, conversation etc... apparantly they're getting worse! Is it catching, do you think? Have they caught it across the Channel from the Brits? Thanks (as always) for the lovely pics. It's always good to see what you've been up to. Lots of beautiful makes, as usual. I'm sure your clients will be thrilled with them. 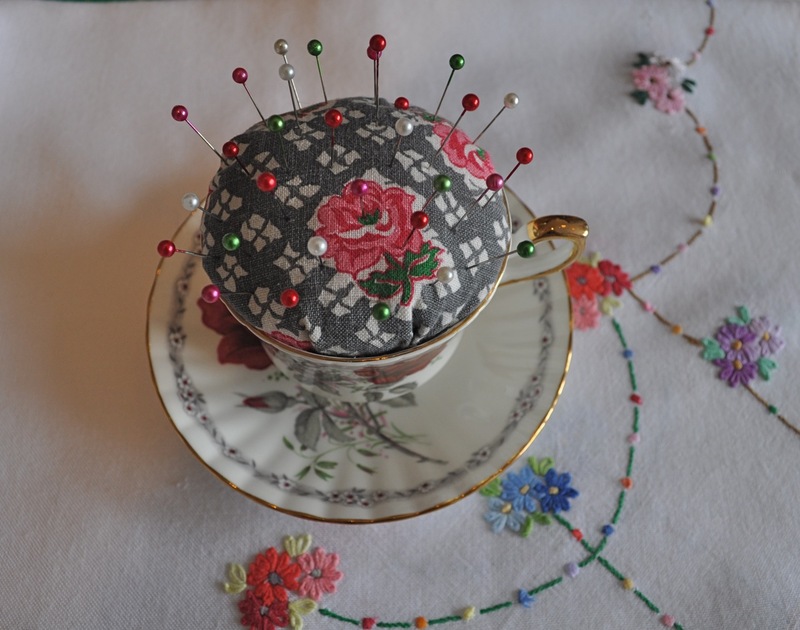 I like the pin cushion cup and saucer. I still can't bring myself to use the candle cup and saucer I bought from you, too lovely! 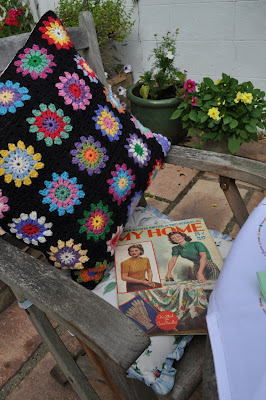 I love your vintage books and the treasures you have made are so fun and colorful very cheery treats!! Wow Hen, you have been super busy lately! I love the cosy and I'm sure my fellow Aussie will agree! STUNNING - everything is gorgeous. Ohhhh, the cake stand is lovely! What a great re-purpose of orphaned plates! 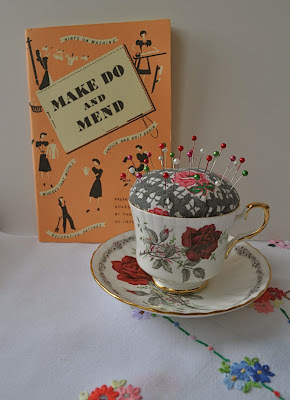 Inspired by you and Marmalade Rose, I've been busily un-yoyoing some rather ugly vintage yoyo circles. Dirty, too, so they've had a good wash and iron. To preserve as much of the beautiful fabric as possible, I'm drawing hexes on the back and gradually piecing them together into a pillow top. Thanks for the inspiration! 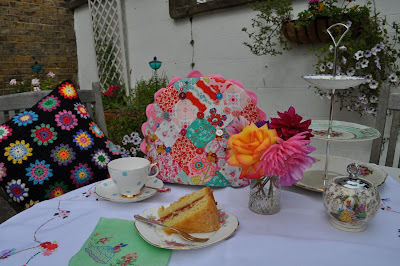 I'd love you to pop over and join in my giveaway! 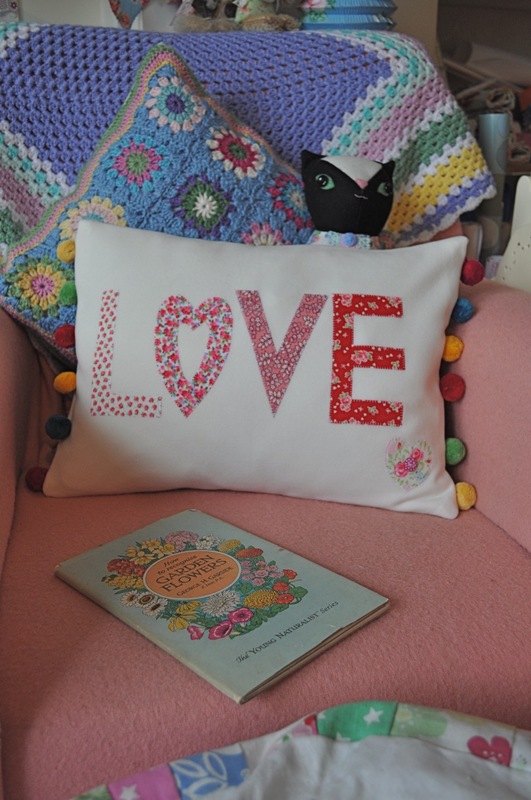 You must have been so busy making so many scrummy things, I love the purple and green cushion. Anyway I am off now to check out that lovely book on Amazon. What a wonderful find! I love the quilt you made from the fabric. My grandfather used to send me Rupert annuals every year... all the way to Canada. 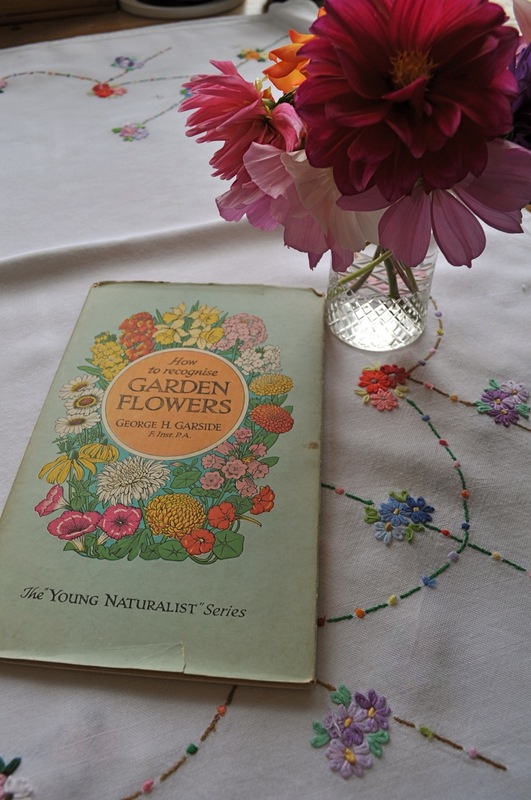 The books, and Rupert's adventures were much loved so it's no surprise that I have kept the books all these years and my sons have loved reading the well-thumbed pages too. Thanks for the bits of Rupert history! So pleased to discover your blog. Will be back for more.